Trailhead and parking area are on Rt. 49, in Waterville Valley, NH (summit is in Sandwich), 9.8 miles from Rt. 93. The parking area is on the east side of the road, and is signed for Sandwich Mountain Trail and Drakes Brook Trail. Sandwich Dome, also known as Sandwich Mountain, is just seven feet short of the title of 49th four-thousand footer. It has the unique distinction of being the highest mountain in New Hampshire under 4000 feet. Hikers upon the summit may enjoy the pleasure of reaching into the air to touch the all-important 4000-foot line. As with any mountain, Sandwich Dome should not be overlooked in favor of our state's more popular hiking list. The hike up is long and strenuous at times, and the reward is three unique and different views. In between scenic vistas, the hiker is rewarded with solitude in the some of the Sandwich Range's most wild and wonderful forests. From the parking area, two trails lead off in different directions. For this hike, follow the trail on the right side, Sandwich Mountain Trail. This trail leads through a field and by a power transfer station before turning into the woods and crossing Drakes Brook. The trail climbs slowly through the forest for half a mile, then enters the Sandwich Range Wilderness. Afterward, it begins to get steeper. As the trail climbs the north slope of Noon Peak, a spur of Sandwich Dome, it becomes extremely steep and rocky. You must endure sustained pitches like this for the next mile, until you reach the summit of Noon Peak. Here, there is a directional view to the northeast. From this perch, the valley of Drakes Brook stretches out below you. Above the gentle Flat Mountain, the higher peaks of the Sandwich Range appear. To the northeast, you will observe the distinctive Tripyramids above the long ridge of Snows Mountain. To the left of Scaur Peak rises distant Mt. Washington. To the left is Mt. Kancamagus, which forms the east wall of Mad River Notch. Above rises Mt. Carrigain. Through the notch, more distant mountains in the Pemigewasset Wilderness. Mt. Osceola is seen through the trees to north, with Waterville Valley below. The trail continues with a brief descent off the summit, following the wild, gentle ridge. Along the ridge, there are scattered viewpoints to the east and to Sandwich Dome as the trail crosses ledges. Lined with fir trees and mosses, the trail passes through a few bogs and climbs at an easy grade to the intersection with the Drakes Brook Trail, the route you will use for descent. This is 1.1 miles past the summit of Noon Peak. Shortly thereafter, a spur trail to Jennings Peak appears on the right. A short but difficult climb gets you up to the large south-facing ledge at the summit. Although there are no significant mountains in the foreground to observe, the view stretches far south. Mt. Monadnock is visible on clear days. The view to the southeast is completely blocked by your destination, Sandwich Dome. After descending Jennings Peak, continue on the Sandwich Mountain Trail. It continues along the heavily wooded ridge at gentle grades, but soon steepens. Pass Smarts Brook Trail on the right after half a mile. After another 0.6 miles, pass Algonquin and Bennett Street Trails on the right and reach the top. The summit of Sandwich Dome yields a standing directional view to the north, looking directly at the impressive south-central part of the White Mountains. The view to the northeast is the same as from Noon Peak, but from much higher. The perspective of Mt. Bond through Mad River Notch is now much better, and you can now see Mt. Carrigain beside the Tripyramids. You can also see further to the west to Franconia Notch and Mt. Moosilauke. An unofficial path leads down from the summit to a restricted viewpoint on the southeast side, toward the Ossipee Mountains. On the descent, use Drakes Brook Trail. This trail is initially steep, but after 0.4 miles, becomes easier, reaches Drakes Brook, and follows it all the way back. 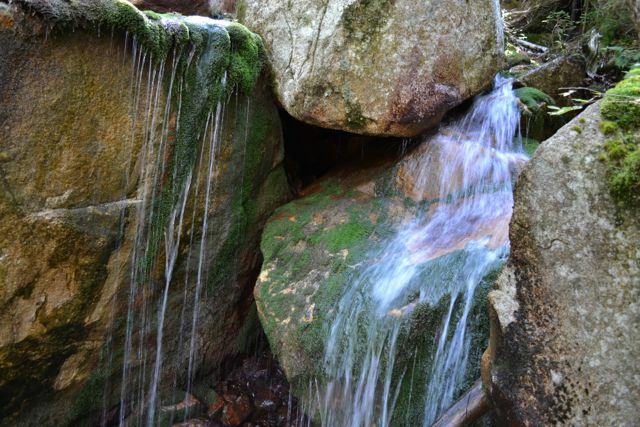 Watch for small cascades in the brook. Cross the brook after 2.2 miles and bear left to join a snowmobile trail as Fletcher's Cascade Trail turns right. It is 0.4 miles back to the parking area.